RAHUL CONSULTANCY & PERSONNEL SERVICES is a privately owned company engaged in Rent-a-Car, Bus Transport, Cab Operators, Travel & Holiday Packages, in Mumbai, Navi Mumbai and Thane Dist, Maharashtra, which was established in the year July 2007 with our goal to provide luxurious way of traveling with superior quality and economical rates. In a short span of time we have become one of the most popular and fastest growing traveller service providers among the travel counterparts in providing travel related services not only in Mumbai, Navi Mumbai and Thane but other parts of the state. We understand your holiday needs and hence we have designed few packages to give you a new memorable experience. We know you would like to relax on your weekends and hence present to you some of the best Weekend packages. We help you for Hotel Reservation, Ticketing for Air, Bus and Train. We use our skills to buy the best service for your money so you may look forward to a great holiday value and excellent standard of service. 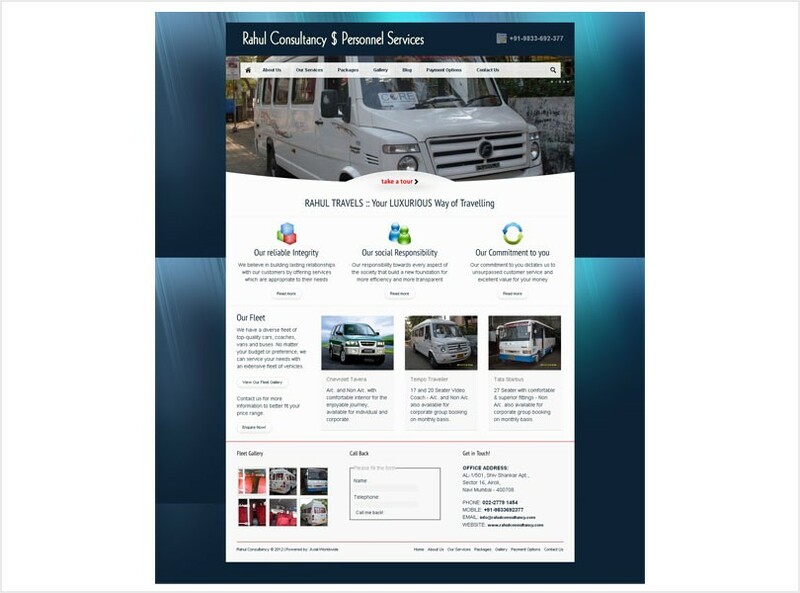 RAHUL CONSULTANCY & PERSONNEL SERVICES is a privately owned company engaged in Rent-a-Car, Bus Transport, Cab Operators, Travel & Holiday Packages, in Mumbai, Navi Mumbai and Thane Dist, Maharashtra.